If you feel that our Day Services sessions will be of benefit to you, you can be referred by your Hospice Community Nurse Specialist, GP or other healthcare professional. 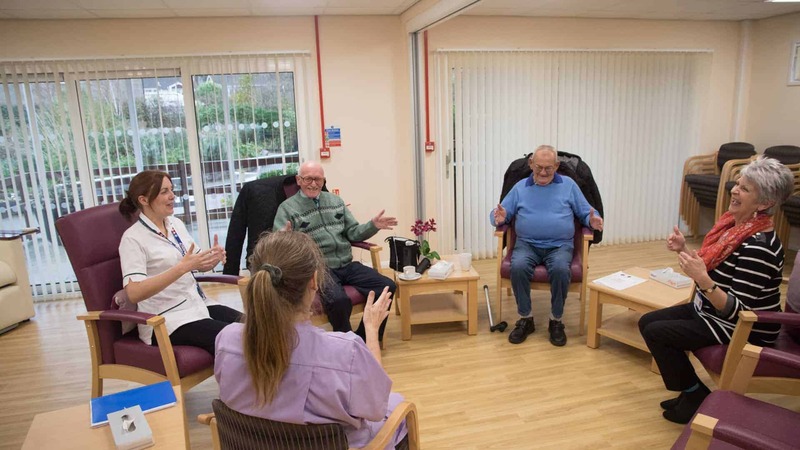 Our Day Hospice sessions are sociable and supportive. When you come in, it’s your day; we want you to take a break, enjoy yourself and have some time to make sure your needs are met. We offer morning and afternoon tea, coffee and cake, and lunch. 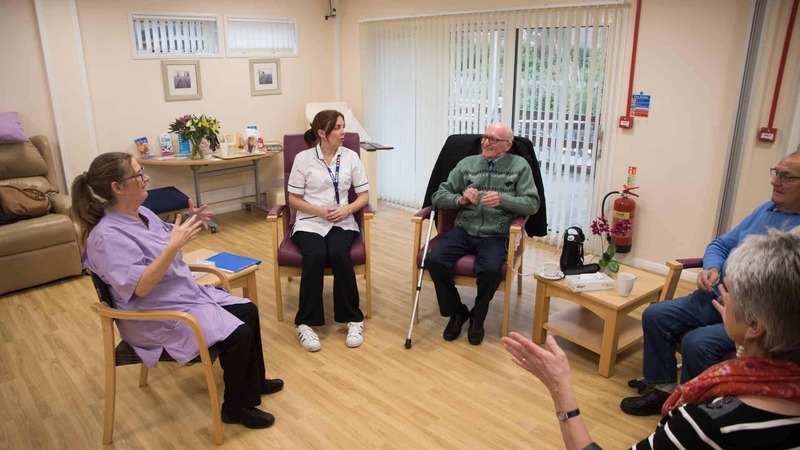 Throughout the day, you will have the opportunity to access services, such as therapeutic exercises, complementary therapies, specialist nursing and therapy support, and spiritual support. You can also chat with various members of our team, take part in various activities, socialise, or just relax and read. We will discuss goals that are important to you to work on during your sessions and offer regular reviews. At the end of each day, the team will make sure you are prepared for the week ahead, and they can help you access other community services, if you would like. Your discharge and ongoing needs will also be discussed and planned with you. We hold a one-hour weekly Expressive Movement Therapy group in the beautiful, spacious garden room at the Wellbeing Centre. Expressive Movement Therapy is a form of creative arts therapy where you can have the chance to share with others and express yourself in your own way, using your own choices of gentle movement, music, words, colourful props and, at times, laughter. Anyone is welcome to join in, and you can choose how much or little you want to do. Read more about Expressive Movement Therapy here. The Fatigue and Breathlessness (FAB) management group aims to equip people with self-help strategies for managing their symptoms. Each group will be attended by up to 12 people that may include both patients and a family member, friend or carer. The course runs from 1.30-3.30pm on a Thursday afternoon for four (4) consecutive weeks in the Wellbeing Centre at Jackson-Barstow House in Uphill by Norma Corp (Physiotherapist) and Stacy Gaynor (Occupational Therapist). Dr Steve Moody, a patient who has twice attended the group, said: “This short programme of information/education, theory, and practical help – together with the simple and tailored activities which complement and support – provides an integrated and personalised approach from which all can benefit. The benefits in terms of small-group therapy and shared experiences are priceless”. Please find attached the FAB Group patient leaflet that gives more detail on the group and the FAB Group referral form that is to be completed by GPs, district nurses, specialist nurses, community allied health professionals and hospital teams, and then emailed to medsecs.hospice@nhs.net or handed direct to Weston Hospicecare in Uphill. For further information about the FAB Management Group, please call Norma Corp or Stacy Gaynor on 01934 423900. To read more about Physiotherapy at Weston Hospicecare, please click here. Explore the benefits that nature has to offer at our new indoor, table-top gardening sessions, which will be held in the Day Hospice at Jackson-Barstow House. We welcome all interested in gardening, whatever your experience. Sessions are offered depending on referral numbers. We are always thinking about new ways to meet your needs. Individual sessions may change as we further develop and refine our offerings. If you’d like to see the most up-to-date list of services on offer, you can ask our team or look on our website at www.westonhospicecare.org.uk/what-can-i-attend/. If transport to and from the hospice is difficult you, we have a team of dedicated volunteer drivers who may be able to help. This service is available for those who are attending Day Hospice (but not individual therapeutic groups). In order to access the service, you must be independently mobile with or without a mobility aid and be able to get in and out of a car independently. There are different guidelines for who can access these services and how you can access them. To find out more information about the groups, talk with either your Hospice Community Nurse Specialist or a member of staff in our Day Hospice.